NatureLink provides subsidized transportation to outdoor spaces and outdoor programming to newcomers. 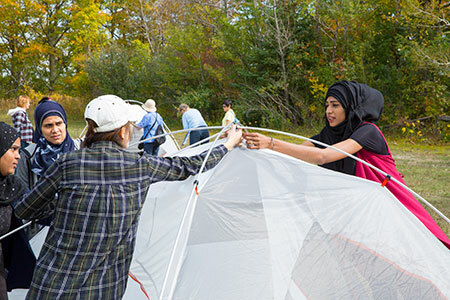 Recognizing the many systemic barriers that can make it challenging for newcomers to access the outdoors, NatureLink works to provide spaces for newcomers to explore new or familiar spaces, learn and build skills to build confidence in the outdoors, and connect with others in a fun environment. NatureLink was developed with support from the Mountain Equipment Coop and Parks Canada and in partnership with CultureLink Settlement and Community Services. TD Friends of the Environment provided funding for Canada 150 Rouge Express shuttle. NatureLink provides subsidized transportation to outdoor spaces and outdoor programming to newcomers. In 2018, NatureLink will continue programming in Toronto and will launch a Vancouver Pilot Project. In 2017, over 800 individuals and 12 agencies participated in NatureLink Toronto. We are excited to extend this programming into 2018 with bi-monthly NatureLink trips to Rouge National Urban Park throughout the summer. Our day programming is active, informative and playful. Our aim is to build people’s capacity to access and engage with the outdoors in their own way. We combine skill-building workshops with play and exploration. 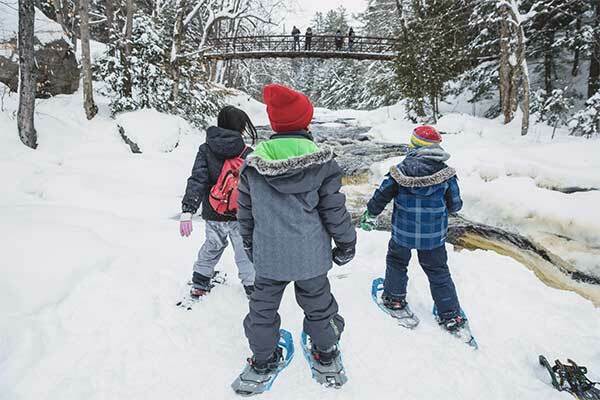 Each program will consist of a Learn-To-Camp Workshop facilitated by Parks Canada, a guided hike and an opportunity to play and picnic together in the outdoors. In a 2017 NatureLink survey, 97% of survey respondents said they were more likely to go outside again and more confident in the outdoors after participating in NatureLink. In addition, 94% of respondents acknowledged learning a new outdoor skill. Come learn about camping, hiking, camp cooking, fire safety, national parks and the outdoors with Parks Canada’s Learn to Camp Program. 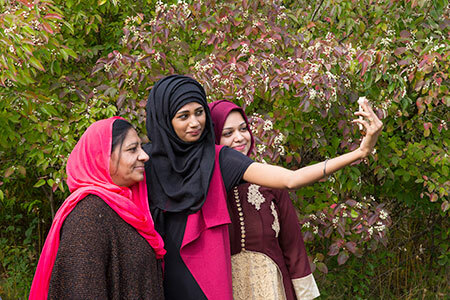 This is part of an extensive program that provides free workshops at public libraries, community centres, events and festivals across Toronto, Mississauga, Markham and Pickering. There are also opportunities to sign up for overnight Learn-to Camp programs every Saturday in July and August at the Glen Rouge Campground. Located in the Greater Toronto Area, Rouge National Urban Park is Canada’s first national urban park. The Rouge protects nature, culture and – for the first time in a Canadian federal park – agriculture, in an integrated way. The national urban park aims to become Canada’s premiere “Learn To” park, as well as a gateway to other Parks Canada sites across the country. Once land assembly is complete, Rouge National Urban Park will be the largest and best protected urban park of its kind in North America. At 79.1 km2, it will 23 times larger than Central Park in New York City and close to 50 times larger than Toronto’s High Park. Want to collaborate with NatureLink? We are looking to connect with agencies, newcomers and volunteers in Toronto and Vancouver. We will be running 12 NatureLink events from Toronto throughout the summer and fall of 2018. NatureLink is launching a 2018 Vancouver Pilot Project. We can assist individuals and agencies in booking free seats on our Golden Ears Shuttle. Agency - is your agency or organization interested in NatureLink Programming? Newcomer - Are you new to Canada and want to take part in NatureLink? Volunteer - are you interested in volunteering or taking part in NatureLink? A storyteller Erin Kang and photographer Sean DeCory joined one of Naturelink trips. At 9 AM on a Tuesday morning, a large group of women and children stood excitedly outside of a Shopper’s Drug Mart on the Danforth Avenue. Some watched on as the bus driver carefully loaded baby strollers through the back of a bright yellow school bus. Curious passersby might have been given a clue to their destination from the myriad of brightly coloured jackets, hiking shoes, and day-packs that decorated the group - likely a result of MEC’s handy resource, the Guide to Day Hiking. Excited chatter filled the aisles of the bus as the group journeyed up the Don Valley Parkway, leaving behind the concrete grey of downtown Toronto to experience the explosion of colour waiting for them at Rouge Park. 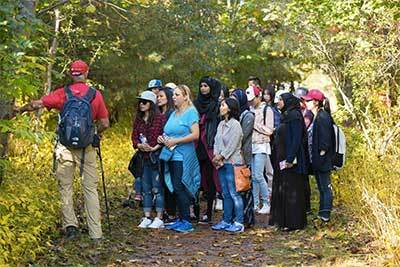 Upon arrival, the group was greeted by Parks Canada staff that would lead them through two activities: How to Build a Camp, and a nature walk down one of the trails. For most, it is their first experience visiting a large, provincial or national park in Canada - and for many, it was the first time visiting a park of that size in their life. People from at half a dozen different countires enthusiastically learned about the wildlife in the Rouge, what you need to build a camp, and how to read maps and trails. Perpetual summer may sound good to some Canadians, but these two have fallen in love with what changing seasons may bring. Listen now. The sense of freedom and independence that being in the outdoors with friends and classmates was very strong for some women. Being able to talk, explore, and eat homemade food with friends offered a deep sense of connection and groundedness. Mehroz Ahmed tells us about her experiences navigating Karachi as a woman - listen now. Engaging our senses helps strengthen learning and connection to the words. 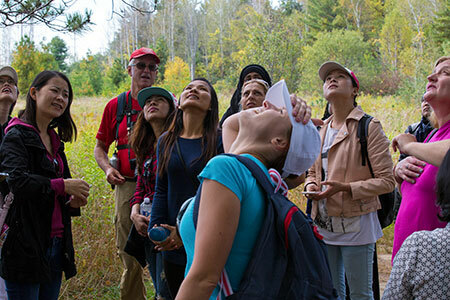 Svitlana emphasizes the value of experiential learning from her trip to Rouge Park. Listen now. For many people who have not been camping before, it can feel intimidating. Having support and resources that teach these skills provides people with a sense of confidence to explore more places. 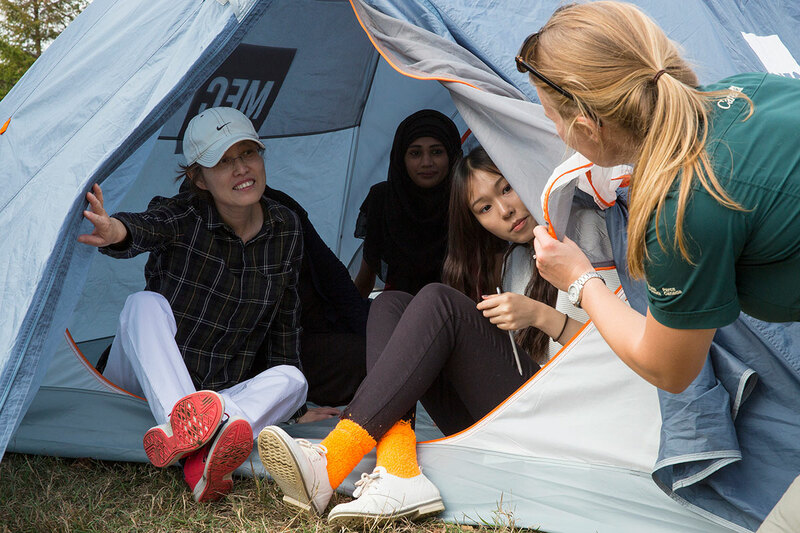 Parks Canada staff shared information on how to build tents and fires, safety practices and emergency routines, and how to read maps and trails. Knowledge is power! 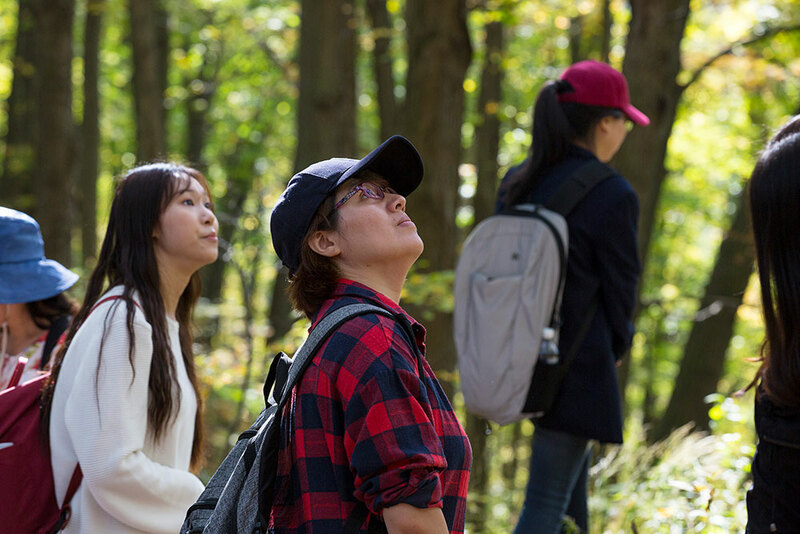 Some women who attended the Rouge Park outing came from countries where accessing nature is heavily regulated, or women are not able to navigate public life safely or autonomously. Others may come from places where they can not only access the outdoors safely and relatively easily, but also may have similar landscapes and climate. Such factors influence how comfortable people may feel in the outdoors. Her deep reflection around this topic also sparked an interest in interrogating the history of her own country, and learning about the Indigenous Filipino peoples that continue to live there. “Learning about this is so special to me,” she says, voice catching with emotion. Truly, being in nature leads to discovery - and we never know where it will lead us next. Sherry grew up in a village in China. As a newcomer to Canada, she knows how valuable first-hand experience is to developing the confidence to navigate the city on her own. She emphasizes how outings like the Parkbus trip to Rouge Park help her feel more independent, especially as she is able to go without depending on her husband to go. 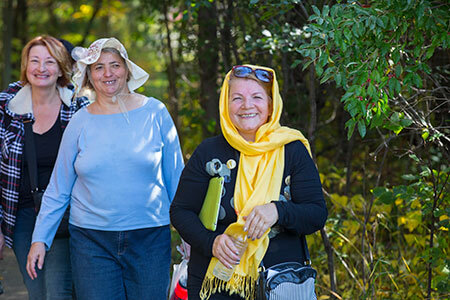 The outing she went on through her classes at Newcomer Women’s Services was the first time Sherry ever visited the outdoors. Sherry was surprised to learn that the Woolly Bear Caterpillars she feared in China were important to the environment. This simple encounter with a fuzzy little creature helped bridge experiences between classmates. In a beautiful moment of intergenerational learning, women huddled around youngsters who were excited to be exploring the outdoors in this new country. It’s not just caterpillars that brought together diverse experiences. Shehnaz from India discusses how eating together with friends in an outdoors environment made her reminisce about her farm back home.